Welcome to another installment of LiveAnalysis! Today’s match-up: Top Nike tennis player Roger Federer versus Top adidas tennis player Andy Murray. Up to the quarterfinals, both men had breezed through the tournament. However, after Andy Murray booked his ticket to this semifinal after brushing aside surprise quarterfinalist Jeremy Chardy with ease, Roger Federer found himself in a near-defeat situation with an intermittently-inspired Jo-Wilfried Tsonga. The resulting five setter did not take quite as long as the epic Djokovic-Wawrinka match (3.5 hours as compared to 5+ hours), but Federer sure had to work hard – and scramble often – to find a way out of that dangerous match. Andy Murray hasn’t needed to do much more than stay on third gear all the way to the semis, since his potential blockbuster against Juan Martín Del Potro got derailed when the tall Argie fell to Chardy early in the tournament. Hence, Murray has played a rather strange assortment of characters on his way to tonight’s match: Haase, Sousa, Berankis, what was left of Gilles Simon after his extremely long and mind-numbing match against Gael Monfils, and a slightly hobbled and new to this stage Jeremy Chardy. That’s the kind of path you find at an ATP 500. Or even a 250. Not surprisingly, Murray hasn’t dropped a set at this Australian Open yet. – This is the first time the pair will meet in a Grand Slam round other than the final. That’s simply remarkable. Compare that to Djokovic and Federer, who have met four times just at the US Open SEMIFINALS, yet only once in a Grand Slam final anywhere (all the way back in 2007) and you see why this is strange. – Murray and Federer have played four best-of-five matches. Federer has a 3-1 edge in them; his only defeat came last year at the Olympics, where the Swiss and Del Potro played the longest best-of-three match in tour history in the semifinals, which was the day before the final. A fee weeks earlier, Murray had managed to take his first set off of Federer in this kind of setting: the Dunblane man won the first set of their Wimbledon final, but then dropped 3 straight. – Federer and Murray have never played on clay against each other, and 17 out of their 19 matches have taken place on hard courts. That’s…pretty lopsided. – The rivalry started way back in 2005, when Murray was just 18 years old. Since then they’ve managed to play each other every year except two: 2007 and 2011. What’s fascinating is that if you take 2008, 2009, 2010 and 2012, you’ll see that they managed to play at least four times in those years….yet not even once in 2011. – I’m looking at their match list, and I struggle to find many compelling matches between the two. Maybe the Madrid and Masters Cup matches of 2008? Their previous Grand Slam matches have been relative duds – only last year’s Wimbledon final was somewhat interesting. 1. Can Murray’s FH step up to the plate today? It’s all about that shot for the Scot, specifically in two situations: on the return of serve on the deuce court, and whenever Federer decides to attack with his own FH CC. Murray has to be able to take away Federer’s formidable slider out wide serve from the deuce court – Murray’s gotten in a lot of trouble when he’s allowed Federer to get free points at will with that serve. The Swiss loves it when he knows he has a money spot in the service box. In regards to the FH exchanges, it’s quite simple: Murray must not only survive them, but he has to win his fair share of them. If the Scot leaves a CC FH short, Federer will move in for the kill. And if Federer is forcing errors during those exchanges, Murray’s confidence will suffer. Jamie’s brother needs to get great depth cross court, but he also needs to be able to hit his FH DTL. That will be key, since Federer’s reply will most likely be a CC BH, which falls into Murray’s best shot. 2. Can Murray put constant pressure on Federer’s service games? Jo-Wilfried Tsonga did such a decent job returning Federer’s serve in their quarterfinal match that the Swiss even mentioned it in his post-match interview. One would think that Murray can do everything Tsonga did, and more. Punishing every single Federer second serve is a must if Murray wants to make Sunday’s final. 3. Can Federer’s BH get the upper hand in the CC BH rallies? Murray doesn’t put a ton of topspin on his BH, so Federer has been able to get in a nice groove with his one-hander during their AD court rallies in the past. Of course, there have been times when Federer’s BH has crumbled after simple CC BH exchanges. But if Federer’s single-hander remains steady, the Nike man will have a huge edge, since that kind of rally is what Murray prefers to be involved in. Also, when Federer is striking his single-hander well, he feels confident enough to go DTL with it, and that’s a great proposition against someone like Murray, who loves to camp on the far edge of the ad court during rallies, and whose running FH is still suspect. 4. How well will Murray be able to handle adversity? Except for Wimbledon, Murray has tended to fall behind in their Grand Slam matches, never being able to threaten any sort of comeback. If Judy’s son loses the first set tonight…will he be able to keep his usual frustration in check and react positively to the challenge? 5. Will Murray be willing to go DTL with his BH often enough to keep Federer guessing? This is another key area for Murray, since he is not as eager to go DTL with any of his shots to begin with. The BH DTL is key, because Federer always looks to occupy the ad court, be it for his own BHs, or for opportunities to run around that shot and hit FHs. Murray absolutely has to avoid letting Federer believe that he doesn’t have to cover the deuce court, but that involves stepping out from his own cross-court comfort zone. The men are about to come on court, so we’ll begin soon! Noteworthy: Federer is going to start the match with his undershirt on. In his last match, he put it on after the first set. In the two matches before that, he did it after two sets. Interesting. In another interesting tidbit, the oddsmakers have made Murray the slight favorite. Last one: it’s apparently cool and windy on Laver today. Weird. Murray won the toss, elected to choose th side of the court that he feels give him an edge with the wind. Fascinating. 0-0: A first BP! Federer was unlucky with a FH that clipped the letcord, but at 30-all the men play a very long, interesting rally, and just when Federer seemed to get what he wanted, a short FH, he sends it long. BP is saved by a swinging volley off a floating return. A bad FH miss by Murray is followed by a great inside-out FH winner off the return for Federer, who holds. Great start – Murray’s gamble with the coin toss didn’t pay off completely, but he did get a BP. It’ll be interesting to see if it really is tougher for the server to hold serve from the near side of the court. I guess we’ll find out now! 1-0, Federer: Federer chips and charges on Murray’s first service point (off a 2nd serve). Gets passed…but that was an interesting message by the Swiss. Two big serves by Murray (one an ace via overrule by the chair, the other a service winner) seal a hold to 15 for Murray. So holding serve from that end of the court wasn’t all that complicated. Why choose to return, then? I was going to type that Murray had played those BPs about as well as I speak German (badly), but in the end, he got one good FH in, and it was the difference. I’ve liked a lot of what Murray has done so far in this match: occasional heavy FHs, angled BHs, good serving. But I did not like how Murray didn’t even consider going DTL with his BH. It’s as if that shot isn’t available to him at all. He’ll need it later. 2-1, Murray: Three service bombs make it 40-0, then Murray sends a FH UFE long. Now, a tame BH into the net, right after Murray had countered well with his FH CC. 40-30. Murray goes DTL with his BH for the first time in the match, approaches the net, but can’t handle the Federer pass. Not sure that coming in made sense there, Andy. Murray then dumps another BH into the net. The rally was neutral. BP against him, after a 40-0 lead. However, a huge ace out wide snuffs Federer’s advantage. Murray gets the edge again after a Federer lob barely misses, but we’re back to deuce after Federer goes for a big inside-in FH return that draws an error. A great Murray 2nd serve (!!!) leads to a comfortable and big inside-out FH and a routine putaway for the Scot, who holds after a fantastic wide serve is returned way long by Federer. That was big. Very, very big. Murray looked to be in serious danger of giving away the break after being up 40-0 in that game. Brad Gilbert’s former employer made a rash of UFEs to get himself out of trouble, but found some great answers with his serve. 3-1, Murray: Federer holds at love, strangely. The Swiss had to save 5 BPs in his first two service games. Murray looked a little flat, as if he exhaled a bit too much after that last service hold of his. Murray has been prone to take his foot off the gas pedal at points during huge matches, and he’s been made to pay for it quite dearly. This next service game should be a nice test to see if that last loose game was just a little blip, or if it will have consequences. 3-2, Murray: Murray holds to 30 with a great service winner. Strangely, both men made pretty bad BH slice UFEs in that last game. Even stranger: it was Federer’s UFE which looked worse. Murray has started ‘by far the better’? It’s 5 games and one tenuous break. Shut up. 4-2, Murray: Two bad FH UFEs from Federer makes it 0-30. Two great passing shots by Murray make it 15-40. Federer has now faced BPs in 3 of his 4 service games. First BP is saved by good forceful play by Federer, 2nd is saved in large part by a spectacular backhand smash by the Swiss. Murray almost hit an insane flick reply that came close to the sideline. A big FH by Federer, and the second break is averted. Interesting serving stats for Federer: he’s getting 56% 1st serves…but only winning 53% of the points played on that delivery. That’s super, super low for him. Federer is even winning a higher % of points with his 2nd serve! The serve percentage is actually higher than it was in the first set against Tsonga (though it started out being in the 40s). So not a surprise – maybe that undershirt is there for a reason. 4-3, Murray: Murray holds at love. The highlight? A gorgeous volley at 15-0. Federer’s pass had been great, and the Swiss was in great position to hit a reply off that volley, but Murray’s shot was just too good. If you can’t double break when Fed is playing as badly as he’s going to, you’re going to lose. 5-3, Murray: Murray came up with a great CC FH return off that lethal Federer slider from the deuce court. That made it 40-30, but a DTL FH error from Murray gave the game to Federer. Enormous test coming up for Murray. He’s serving 70% 1st serves, and winning 84% of those points. However, he’s only won 38% of points won on his 2nd serve. Hence…he better find some first serves right now. 5-4, Murray: Murray starts with an ace, but then Federer goes on the offensive with a great CC FH. A few shots later, the Swiss levels the game at 15. Federer then floats a return JUST long. 30-15. 1st 2nd serve of the game coming up. Murray goes for a huge, HUGE inside-in FH that takes Federer completely by surprise (hell, it took EVERYBODY by surprise) and it’s double set point. A service winner up the T, and Murray takes the first set. 4 out of 5 first serves…hold to 15. Interestingly enough, the lone point played on Murray’s second serve was actually won by Murray. 0-0: Federer mishandles the first return by Murray, but then goes on the offensive with some nice wide serves and some powerful FHs. At 40-15, Federer goes for a strange loopy FH DTL that misses by a mile. 40-30. Federer then double-faults for the first time in the match. A good FH is followed by a bad Federer FH, so we’re back at deuce, when Federer serves and volleys, and comes up with a GREAT half volley to get the AD, and holds after a great BH DTL. That last shot, Federer’s BH DTL is what could turn the tide for the Swiss: he barely went there in the first set, and it’s clear that Murray is more than happy to leave that side wide open. 1-0, Federer: Murray approaches the net after a terrible shot…and you can guess what happened to him. Two Murray service bombs sandwiched a very good CC FH byt he Scot, and he holds. That’s interesting, no? PMac said that this is because Federer isn’t doing much with his serve. 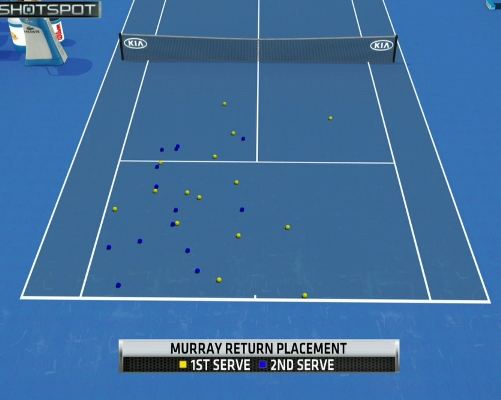 I disagree: this is Murray’s normal return pattern against most people. It just so happens that he’s getting great reads on Federer’s 1st serve today. We are talking about an elite returner of serve, no? Probably the 2nd best in the world? 1-1: Federer DFs, but fires an ace to hold to 15. Not much more to say about that. I was going to type that Murray is getting fewer looks on Federer’s two service games of the set (as a comparison, he created 5 BPs in the first two Federer service games of the first set), and there’s a reason for that: Federer is now serving at 80% 1st serves. The problem for Federer? Murray’s at 100%. 2-1, Federer: Murray keeps serving well, so a great Federer CC FH winner only manages to make this a hold to 15. 2-2: Murray hits a fantastic CC FH winner, but then gets pulled just a little too wide nets the shot. 15-30, and then a bad Murray UFE levels the game. 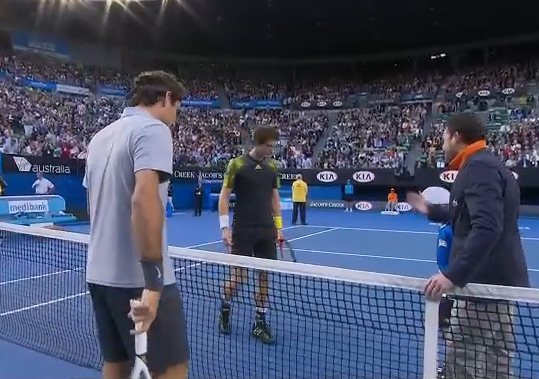 Federer screams “Allez!” after Murray nets a FH – they had exchanged blows for a bit. However, Federer then dumps a BH slice cheaply into the net, so we’re at deuce. First time Murray has been this far into Federer’s service games this set. It’s a short stay, though: Murray sends a return just a little too long, and then Federer fires an ace. 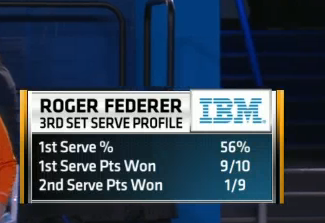 Federer went from serving 56% 1st serves in the 1st set to serving 83% (!!!!!) 1st serves in this second set. That’s 3 games worth of data. Is the tide turning? 3-2, Federer: At 30-all, Murray approached Federer’s BH with a slice. Normally, this would be near suicidal, but Murray’s sliced approach was simply wicked. Forced the error from Federer, and another ace out wide clinches the hold. During this game, Murray gave a strange look to the sky. Cahill mentioned that there was quite a bit of light out when the match started, but now the lights are on, and the night has fallen. First time Murray has seen these conditions all tournament. 3-3: The game starts with the point of the night – a cat and mouse exchange that ends with a Murray FH volley. That was fun. However, that is followed by three missed returns by Murray. So…a whole lot of work for a 40-15 deficit. However, Federer misses an inside-out FH wide, so it’s 40-30. The game ends with Murray unable to handle a running FH. Federer is coming. His shots are crisper, the serve is singing. The only thing keeping him at bay is Murray’s good serving. I correct that. Murray’s SUPERB serving. 4-3, Federer: Murray continues with his extremely-above-average serving, but clinches the game with an incredible chase-down of a Federer dropper. 4-4: Federer again tries a dropper, and again he’s foiled by Murray. However, that’s the only point the Swiss loses on his serve. At 30-15, Murray sent a BH UFE way long – a cheap error. Both men have cooled off a bit in terms of 1st serve %: Federer is now at 76%, Murray at 70%. Cahill is quite correct in chastising Federer for not doing much with Murray’s 2nd serves, which are almost always kickers to his BH. The Lindt man has been slicing those serves back almost exclusively. 5-4, Federer: A grueling all-court rally ensues at 15-0, and it ends with a Murray BH that goes just a little too wide. The pair then play another fun point, where Murray survives two huge Federer FHs, and in the end comes up with a beauty of a BH DTL – A BH DTL FROM MURRAY! Amazing. 30-15. Huge wide serve again from the ad court (Federer isn’t getting any sort of read on that one), and Federer starts getting cranky. The Swiss then misses a simple BH return, gets even crankier, challenges, and fails. Key hold for Murray. Apparently, Federer cursed in that last game. I didn’t catch it. 5-5: A great stab volley from Federer makes it 40-0 in about a minute for Federer. He really is coming. A missed 2nd serve return by Murray (never a good thing for him) clinches the hold. The quality of Murray’s passing shots has dipped somewhat dramatically. He’s making the same mistake he made at Wimbledon: going right at Federer, who has great hands and great improvisational skills. He needs to go AWAY from the Swiss. 6-5, Federer: Murray with some strong serving to hold to 15. Federer had his token CC FH winner in that game, naturally. Tiebreak City! 2-1, Federer: The Mercedes Benz man wisely pulls Murray wide on his FH, forces the error. 3-1, Federer: Floater return, easy swinging volley for Federer. 4-1, Federer: Service winner for Murray. Sorely needed. 4-2, Federer: Murray survives a Federer slice that clipped the letcord, then a lob that barely caught the line, and a bad line call that would’ve robbed him the point. As Cahill says, thank the heavens for the challenge system. 4-4: That trusty slider out wide from the deuce court strikes again for Federer. 5-4, Federer: Two fantastic FHs from Murray from the middle of the court force Federer’s error. Where were those at the beginning of this TB? 5-5: Murray…has a mental breakdown. Federer’s wild stab pass was going way, way long. Murray reached for it, and left the ball hanging. Federer passed. MINIBREAK, and SET POINT. 6-5, Federer: Federer goes for what has worked so often in his rivalry against Murray: he pulls the Scot wide on his FH side, forces the error. 0-0: Federer runs around his BH and fires a winner to start. However, Murray wins three straight points aided by a couple of good serves and a bad FH UFE. Murray loses another of those CC FH rallies, but wins the game when he goes for an angled CC BH winner. Murray’s running FH is not working nearly as well as it needs to…and Federer knows this. That’s where he’ll go in key points. 1-0, Murray: Murray goes up 0-30 after some loose errors from Federer, but the Swiss comes roaring back with some great shots. However, Murray finally manages to find Federer’s BH for the first time in a while, and he hammers it until it breaks. First BP in what feels like a lifetime. However, Murray misses his 13949595095th running FH, and it’s deuce. An ace and a bad Murray BH UFE, and Federer holds. Murray is losing almost every single CC FH exchange, and he’s not getting Federer into CC BH exchanges. He’s still serving well, which is the lone bright spot. 1-1: Murray somehow holds at love, after a ridiculous FH squash shot to tempt Federer into a FH DTL that goes just wide. 2-1, Murray: Three straight FH misses by Murray (two on returns, one a running FH), and it’s 40-0. An error from Federer stalls the hold for a second, since Federer sent a slider out wide for an ace. 2-2: Not for the first time in the match, the men play a great point to start a game. Murray dictated throughout, but couldn’t find an opening. The point turns when Federer gets a look at a BH DTL and Murray can’t handle it. Later, a terrible BH error from Murray makes it 30-all. Amber alert for Murray. Something strange happens: Murray comes on top of a CC FH exchange. Federer sends a FH long. Bad error from Federer, who has been looking like the better player for the past hour or so. Murray then goes on the offensive, and smartly approaches the net after a very good inside-out FH from the middle of the court. An easy volley marks the hold. There is a siege on Castle Murray, and so far, Murray has survived. His FH had been losing almost all of the recent exchanges, but managed to win a key one in that last game. Federer is dialed in, and is making (mostly) correct decisions on the court. This set seems like it will determine the outcome of the match. 3-2, Murray: Return winner, then a BH DTL that forces Federer’s error. Murray’s head is back, it seems. He needs to use that BH DTL. He’s hit no more than 4 all match. Murray then gets a great CC BH that barely clipped the line (if it ever did), and then sent his reply long. 0-40. Wide serve, CC FH, and the first BP is saved. Then…strangeness happens. In a neutral rally, where nothing much was happening (in fact, the rally was just starting), Federer goes for a DTL BH that wasn’t even aggressive…and sends it well wide. Murray breaks! 4-2, Murray: Murray consolidates the break with a love hold. Best. Possible. Response. 5-2, Murray: Federer manages to find some of the serves he needed in his previous service game, and climbs to a 40-15 edge. Murray then wins ANOTHER running FH. The tide has turned again! But Federer still holds after a big serve. This was shown at one point during that last game. So…Federer has come back down to Earth after his incredible serving performance of the second set. Still, he only face 1 BP until that calamitous 2-3 game. 5-3, Murray: Murray starts the game with a very soft FH UFE. However, he climbs to a 30-15 lead after a rare BH DTL, and then an ace. After that? A great, GREAT inside-in FH, and the set is sealed with an ace. That…was impressive form from Murray. The confidence of being a Slam winner? On the replay, that didn’t look like much: maybe a little slip, that’s all. Federer then had a game point, but makes another error and it’s deuce again. Still, some great CC shots give Federer the AD, and then the hold. Smart to move Murray around after that tumble. That ended up being a very interesting game. The BP that went by, Murray’s tumble, etc. Still, Murray seems to be moving well – maybe it was just a scare. 1-0, Federer: Murray is not losing FH-to-FH exchanges, and he’s getting some good weight on his putaways. Holds to 30, with two great forehands from 30-all on. 1-1: A very smart Federer hold to 15, built on that bedrock of a slider out wide from the deuce court. It’s such a beautiful, deadly serve – the best of this era, I think. 2-1, Federer: Three straight UFEs by Murray, and it’s 0-40. Out of nowhere. This match is strange. 1st BP is saved by a nice slice serve up the T. Then a slider out wide! That had a TON of pace. Huge serve, and at what moment. Still, one more to go for Murray. The pair have a tentative rally, and Federer goads Murray into a CC FH after he sends a BH slice into Murray’s deuce corner. Murray obliges…and misses. Federer breaks! 3-1, Federer: Federer consolidates to 15, in what felt like a minute-long game. Murray once again let his focus waver at a key moment of the match. It reminded me of the mistake he made by playing so loosely in the fourth set of his SF last year against Djokovic. When you’re playing against a great player, you just can’t afford these lapses. Inevitably, they end up costing you breaks of serve, if not entire sets or matches. 4-1, Federer: Murray holds to 15 after a bomb up the T.
4-2, Federer: Federer plays a very silly dropper that Murray easily tracks back at 30-15, and then Murray gets a fantastic CC pass that Federer can’t handle, and he has a BP. Out of nowhere, Murray then goes on the offensive on the second ball with a fantastic inside-in FH, and puts away the very short reply. That unnecessary dropper at 30-15 ended up being quite costly for Federer. The Swiss was in complete control of the game, and of the set. And just as quickly, he let it go. You can be a very smart tennis player, but if 1 of the hundreds of shots you hit in a match is imprudent, your world can come tumbling down. 4-3, Federer: Federer gets ultra lucky at 30-15, with a BH pass that clips the net just enough to go past Murray, but then needs no luck at all to blast a BH DTL for a gorgeous winner. On the BP, Murray hits a 2nd serve, Federer pummels a FH return, gets a short reply, and overcooks the putaway. An ENORMOUS missed opportunity. Murray then is allowed to pound FH after FH into Federer’s BH, and forces the error. A chance to hold. However, Federer again runs around his BH for a 2nd serve return. Deuce. Then, after a tense AD court rally, Murray absolutely SMOKES a BH DTL. That was beautiful. And rare. Then, a controversial point, as a ball is called out, then overruled, then challenged, and proved to be in. They will replay the point. Murray stands on the middle of the baseline, and blasts away with his FH, forcing the error from Federer. That’s assertive, slam-winning tennis. And just as I type that, Murray moves in for a short FH, and nets it. Deuce. THIS IS A HUGE GAME. Murray goes out wide – Federer gets masterful return DTL, but Murray cleanly redirects it CC. Amazing series of shots. Then Federer strangely frames a simple FH, and Murray has held. 4-4: A lob so gorgeous it’s difficult to describe makes it 0-15. A FH UFE from Federer makes it 0-30. But two good serves let the Federer FH feast, and it’s 30-all. Then…a 2nd serve return is sent long by Murray. A very, VERY bad error. Federer gets a crazy wide bomb, Murray somehow gets it back, and Federer overcooks the putaway FH. Incredible. Federer holds after a FH barely catches the sideline, and a service winner. Murray can’t challenge anymore, so who knows what that FH by Federer at deuce does to his mind during the changeover. He smiled sarcastically after it. Still, the key in that game was the botched 2nd serve return (a BH return, no less) at 30-all. That was the opportunity for Murray. 5-4, Federer: Murray holds at love after some good serves and another terrible dropper from Federer. 5-5: Murray up 0-40 after some great, GREAT CC FHs (!!!!!!) And on the first BP, Andy Murray does it again. He survives a Federer FH onslaught, and then goes on the offensive with some nice angled CC FHs of his own. Murray breaks! That was impressive by Murray. What a way to show the progress he’s made with his FH. That game was essentially won with his weakest shot, which has come a long, LONG way. 6-5, Murray: Murray passes Federer with a great FH DTL, but Federer then stays close to net, apparently saying something. Murray looks at him, smirks sarcastically. A little after that, it’s 30-all after a great FH DTL from Federer. But Federer then gets incredible depth with a slice BH first, and then a beauty of a BH DTL winner. BP. Murray gets a 1st serve in, Federer gets a desperate low slice back, and Murray misfires the putaway FH. Federer breaks! 0-0: Murray goes for a BH DTL, nets it. 2-0, Federer: Service winner by Murray. 2-1, Federer: Murray again forces a Federer FH error with his own CC, topspin heavy FH. MINIBREAK. 2-2: Murray scrambles, survives, and just when he has a simple BH, he sends it way long. 3-2, Federer: Federer goes on the offensive again, with that deadly FH DTL, forces a smash, and while Murray gets a look at it, he can’t put the return in play. MINIBREAK. 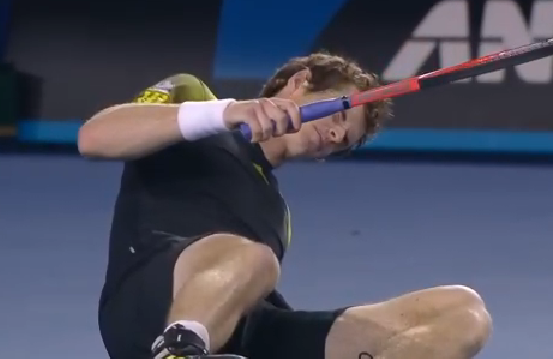 Murray broke a string there. 5-2, Federer: BH return missed long by Murray. Quadruple set point. 6-2, Federer: 2nd serve return missed by Murray. 0-0: Murray holds to 30 – an UFE made things look dicey at 30-15, but danger is averted. 1-0, Murray: At 0-15, Murray again easily tracks back a dropper, but instead of going for the open court, fires a BH straight at Federer. He misses the Swiss, and misses the court. Federer then gets a FH CC by Murray from way deep, but can’t cash in on the momentum, since he hits two straight UFEs. The trifecta comes after a classic Federer BH shank. Put it in orbit, there. Murray breaks! 2-0, Murray: Murray fires away with his FH, and is up 40-0. Another awful drop shot from Federer ends the break, and Murray consolidates. I’m so impressed with Murray’s mental toughness. Because navigating this match has been far, FAR from easy. The crowd has been completely against him since the end of the second set, and of course, Murray had that huge mental breakdown at 5-all in the 2nd set TB, and then failed to serve out the match at 6-5 in the fourth. This will most certainly build character. 3-0, Murray: Murray gets a pair of easy return winners in, but misses a couple of passing shots. At deuce, a service winner gives Federer a chance to stop the bleeding and hold. Which he does – after Murray misses a BH DTL attempt. Cahill says that it’s tougher to hold serve from the far end of the court today. Says it’s stiffer or something. I don’t know what he means. 3-1, Murray: A BH DTL makes it 40 love for Murray, who started with two HUGE bombs from his serve. A blistering DTL FH winner makes it a love hold for Andy Murray. Andy Murray’s game seems so much cleaner right now. As if he’s shed all the tension and the troubles of the previous four sets. It’s impressive to see. Also, Federer has won all of 2 points on return in this set. Out of 14. And a solitary point with his own 2nd serve. 4-1, Murray: A rare love hold for Federer. He fired away with his FH, and Murray was a little loose with a couple of returns. 4-2, Murray: Two aces in this game take Murray’s tally for the match to 21. Which is amazing. Federer’s ace total? 5. In related news, Murray again holds at love. Murray can’t afford to play this next return game casually. He needs to put a ton of pressure now, and avoid letting Federer have any semblance of momentum. 5-2, Murray: A very casual BH UFE from Federer makes it 0-15. A rushed CC FH goes wide, 0-30. A very short return is impeccably put away, 15-30. Murray kills a 2nd serve by Federer inside-in, and he has double match point. 1st MP is saved by that trusty slider out wide. However, Federer sends a FH long in the next point, and Andy Murray wins! One stat for the match — Murray had 21 forehand winners, Federer 18. @juanjo_sports Serve+FH combo won him the match. Plain and simple but deadly. 1. Andy Murray finally beat Roger Federer in a Grand Slam match. He was 0-3 until now. Maybe all he needed to do was face the Swiss in a round other than the final! 2. Murray’s FH did all sorts of great things today. I absolutely loved how Murray stepped to the middle of the court after a short ball and fired deep and heavy shots into the corners of Federer’s court. It was assertive, and it was emphatic. I also loved how Murray used his inside-in FH from his ad corner: we know that Murray doesn’t trust his BH DTL as much as his contemporary from Serbia does, but driving this FH as if it were a BH DTL won him some key points. I’m not going to say that Murray’s running FH was amazing at all times today, but I do think that it did enough to put the Scot in positive situations from time to time. Federer also got plenty of free points with his all-time-great slider out wide serve from the deuce court, but Murray did manage to get some key FH returns as well. Overall, though, it was a fantastic performance from a shot that was much maligned in years past. What I liked was the attitude of WANTING to dictate with that shot, as well as how heavy Murray’s ball seemed to be. Long gone are those fluffy FHs that sat up near the service line of Murray’s opponents. And the great thing is, when Murray is being assertive with his FH, the rest of his game benefits from the confidence boost. 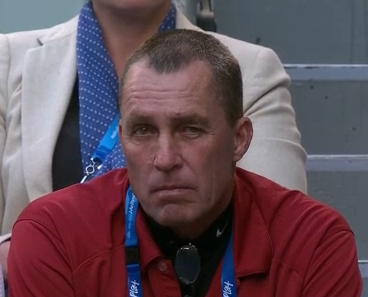 Ivan Lendl, what a job you’ve done. 3. Murray overcame huge adversity in this match. After taking the first set rather comfortably (you could argue that there was a bigger gap between the men than one break – Murray created 7 BP chances, while Federer only managed 1), Federer started to serve at an incredible level. And then, at 5-all in the tiebreak, Murray made that horrible mental (instinctive?) mistake of sticking up his racquet to reach a Federer desperation pass that was headed for the back fence. A mistake like that would rattle the biggest of champions – yet Murray stuck with it, and took his chance to win the third set. Then, of course, Murray had to deal with the inevitable frustration of losing a set he served for at 6-5 in the fourth set. A hold there would’ve ended the match! Losing his serve at that critical juncture, and botching the 2nd set tiebreaker in such cringe-worthy fashion surely had to be enough to destroy Murray’s psyche, no? Nope. Not at all. Murray shed all the nerves, all the tension, and went up 3-0 in the deciding set like it was nothing. Very soon, he would wrap up the match. That kind of mental fortitude, the kind that survives the adversity faced by Murray today (with the added difficulty of a blatantly partisan crowd since around the 2nd set tiebreaker) is what champions are made of. 4. Murray managed to serve at an incredibly high level for five sets. The narrative about Andy Murray’s serve was that while the 1st delivery was potentially huge, it wasn’t reliable, and the 2nd serve was as soft as they came. Well…today Andy Murray served up 21 aces, hit 64 % 1st serves, won 75% of 1st serve points, and an astounding 63% of 2nd serve points. Yes, Federer managed to get a look at some pretty short and slow 2nd serves near the end of the fourth set – but that was an anomaly. The norm were deep 2nd serves with more pace than what we’re used to seeing. Again, take a bow, Ivan Lendl! Maybe Andy Murray spent way too much energy today, and won’t recover in time for Sunday’s final. Maybe Djokovic comes out firing like he did against Ferrer. Regardless, today’s win has already made the Australian Open a success for Andy Murray. His superior H2H over Federer now doesn’t have that annoying asterisk of “but Murray’s never beaten him at a major”. That’s over. Murray’s done it, and he really should have done it in 4 sets. I don’t expect Andy to make the same mental mistakes he made in that 2nd set TB or at the end of the fourth set in the future. It seemed to me that judging from Murray’s demeanor at the end of the match, Judy’s son not only believes he can win these matches – he believes he should win them. Which is where you want to be when you face someone like Federer. Speaking of the Moet Chandon ambassador: Once again he got to a fifth set of a match he probably should have lost before that. The difference ended up being that Tsonga was unwilling to lay the hammer, but Murray wasn’t as forgiving. What is impressive about Federer is how incredibly poised he is in tiebreakers. He won all four he played in the last two rounds – and there was no margin for error in either of them, particularly in both fourth set breakers. If Federer had lost his focus, he was out of the tournament. Simple as that. What let Federer down today was his return of serve. Any scenario that involves Andy Murray winning over 60% of his 2nd serve points is quite troubling for anybody. Federer seemed indecisive as to what stance to adopt consistently: should he slice the returns back, as he has done for most of his career? Or should he go for aggressive BH returns? Should he run around the BH and just blast FHs, Fernando González’ style? Federer tried all of these at one point or another of the match, but didn’t seem to settle on any of them. You could argue that Federer was trying to keep Murray on his toes – a valid point. However, the endless variation of return approach just signaled to me that Federer wasn’t really sure what the right one was – it was like someone frantically trying different keys to open a lock. A puzzling area of Federer’s performance today was his bizarre decision to frequently drop shot Andy Murray. He ended up winning either one or two of those points, and one of them only because Murray went straight at Federer’s body with a passing shot, in a sort of “read this message” way, after the pair’s fourth set spat. The main problem was that Murray wasn’t even dropping back behind the baseline as much as he used to in past matches, so playing that many droppers was always going to be problematic for Federer, who wasn’t even getting some of then over the net. The other part of Federer’s tactics that I didn’t particularly like is how infrequently he went for the BH DTL, or the inside-in FH down that same sideline on the ad court. Federer seemed way too eager to engage in AD court rallies, with the only goal of blasting inside-out FHs. He attacked Murray’s FH from his own FH corner, but I think he could have done more damage had he looked for ways to make Murray scramble to cover that deuce court. After all, the reply would set up a Federer FH DTL – a shot Federer actually hit relatively well today. Of course, there are a few voices out there writing Federer’s eulogy already. Which is extremely silly, given that we’re talking about the current #2 player in the world. And #2 by a wide margin, unless Murray wins the title. Yes, Federer had that unusual undershirt all tournament, with the strange pattern of putting it on after 2 sets in the first 4 rounds, then after 1 set in the quarterfinals, and coming out with it today right from the start. People have mentioned that this is what Federer does when his back is bothering him, and usually when that happens, it’s the serve that suffers. However…Federer did not lose today because of his serve. He still served 61% for the match (though it wasn’t a “constant” 61% – he had four sets serving in the 50s, and one in the mid 70s), and won 73% of points played on that serve. Let’s not forget, Federer was playing against someone who is arguably either the second best returner in world, or co-best returner in the world. As I mentioned above, Federer lost today because he just couldn’t find ways to put pressure on Murray’s serve. He didn’t seem to be able to read the wide serve from Murray’s AD court at all, and as I mentioned, he seemed undecided in terms of what to do with Murray’s 2nd serve. Still, there were too many good things from Federer tonight (and seriously, nobody can really return that slider out wide serve of his anyway) for anybody to say that the Swiss is done. He’ll still challenge everybody this year. The only problem for the World Number Two? Andy Murray is reaching his prime as an athlete and also as a tennis player. But Federer shares that problem with everyone else on the ATP tour. Hola mijito; estoy en Ginebra y te estoy siguiendo en el análisis del partido, me alegra, me imagino tendrán muchos seguidores. Estamos en contacto. Creo que va a gañera RF en cuatro. Hola papá! Espero estés bien en la tierra de Federer (aunque él es de la parte alemana de ese país). El partido estuvo bastante bueno, para qué también. Este torneo ha sido una locura, pero todo va bien. Cuando se termine está de hablar – obviamente si ya estás de vuelta en el Ecuador! Abrazo grande! You have proven to be every bit as good a regular tennis writer as your tweets and Tennis.com postings have indicated over the past seven-plus years. Your hallmark is that you pack more thought-provoking insights into one match post than many others in the profession. So much to ponder here. 85 percent of what you say is undoubtedly correct, 15 percent quite debatable (I have to get you to reassess the 2012 Wimbledon final to a level beyond only “somewhat interesting” 😉 …), but 100 percent of it makes me, the reader, think. That’s what good content does. Matt, you are way too nice. I’m glad you liked what you read. And disagreement is good! I do think I’m quite harsh with the 2012 Wimbledon final, but are there other good Federer-Murray matches? I can’t think of any. I only saw the end of the fourth set and the fifth, so I’m grateful to Juan José’s tireless work throughout the tournament on these analyses. It really just looked like Murray was too much for Federer to handle in the end, and up until now I think Nadal is the only person about whom we could say that. Glad you liked these, Matt! Indeed – except for the second set and half of the third, Murray looked like the better player throughout (even when he got broken at the beginning of the fourth). He’s improved so much, and just refused to cave in despite the many opportunities to do so. I keep thinking about your last comment…what if Azarenka yells something like that to a fellow player midway through a tense third set? The horror. The horror. Thanks for these analyses, Juan, they are much appreciated. You’re very welcome, Henk. Thanks for reading!